We’re pleased to share this news with you. This will open up all kinds of new possibilities for future tours! Construction is starting on the long-awaited Lamoille Valley Rail Trail (LVRT), a four- season multi-use recreation trail. The groundbreaking will take place on Friday, July 19 at 5 p.m. at the site of the soon to be constructed bridge on Mt Vernon Street in St. Johnsbury. Senator Bernie Sanders, a major force behind the realization of the LVRT has been invited, as well as many other dignitaries who see this rail trail as an economic and recreational engine for the area. The public is urged to attend this celebratory event and see how enthusiasm, patience and hard work has made the trail a reality. 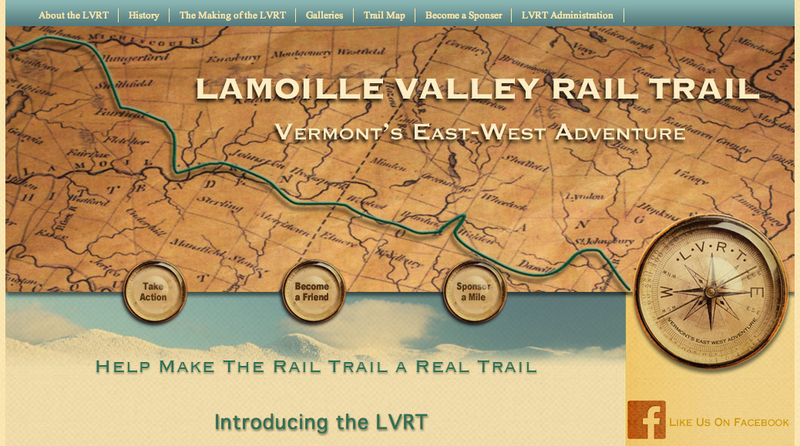 The LVRT is a partnership of VTrans and the Vermont Association of Snow Traveler (VAST). The LVRT will eventually cross the state of Vermont, over 90 miles, from St. Johnsbury to Swanton. After a lengthy process, VAST received an Act 250 permit for phase 1 of the 3 phased project and is now poised to begin the construction phase. Once complete, the LVRT will be the longest rail trail in New England. Construction on Phase 1a, approximately 13.5 miles from St. Johnsbury to W. Danville, will begin this summer with the building of the bridges on Mt Vernon Street and the over the “Cahoon washout” in Danville. Blow and Cote, Inc. from Morrisville, VT was awarded the contract for the Phase 1a bridges. Dufresne Group will serve as inspectors on the job. The public is invited to come see what’s happening, what’s planned and to learn the benefits from this trail, as well as how to help make it a truly first class recreation facility. There is limited parking on Mt. Vernon Street, as well as parking at the Park and Ride on Rt 2 and the vacant lot across from the Fairbanks Motor inn. Parking is also available at the Three Rivers Recreation Path trailhead off of South Main St in St. Johnsbury, reaching the site of the groundbreaking by walking one mile along the Three Rivers Path. This entry was posted in News! and tagged Bernie Sanders, bicycle tours, bike touring, biking, cycling, Discovery Bicycle Tours, inn-to-inn bicycle tours, Johnsbury, Mt Vernon Street, Rail trail, St. Johnsbury, St. Johnsbury Vermont, vermont, Vermont Association of Snow Traveler. Bookmark the permalink.